Welcome Grace! We’re so glad to have you with us, even though, as most of you probably know, Grace actually reviews for Into the Book already. Grace is conducting a blog tour for the launch of her latest book: Firmament: Radialloy and Into the Book is the last stop! Thank you for having me! It’s exciting to be here. Into the Book: So, have you always been a writer, Grace? Or did you stumble into writing accidentally some fine day and start automagically crafting novels? What attracted you to writing, rather, what do you like about writing? I can’t remember a time that I couldn’t read. I grew up on books and movies, everything from Little House on the Prairie to My Fair Lady, from Roy Rogers westerns to Disney princess films. I would always act out stories with my dolls, my toys, or sometimes just by myself, while my mom and siblings napped in the afternoons. Basically, I love stories. I love the drama, emotion, the way I can experience and learn things I otherwise never would. Writing my own stories allows me to decide what I will experience, and to share those experiences with others. ItB: Firmament is going to be an 18-book series. That’s quite ambitious! Where did you come up with the inspiration for Firmament itself? I’m a fan of the Star Trek series, and have enjoyed watching the show with my dad and siblings–loving the characters, settings, and interesting situations, but the but never appreciating the humanistic and atheistic messages in nearly every episode. I couldn’t help wishing there was a Christian sci-fi series, with that fun sciency feel and fun ongoing characters, but with more biblical values. The obvious solution was to write one myself, so I did. ItB: In general, how do you usually get inspired? If, for example, you aren’t at all motivated to work on a project you’ve started? Writing is a bit the way that Edison described genius — one percent inspiration and ninety-nine percent perspiration. I don’t worry if “inspiration” is lacking from time to time, which it inevitably is. I just press on, grinding out the next sentence, the next word, the next letter. Even if it’s horrible, I just keep going, push myself through to the end. I stopped believing in writer’s block a couple years ago, and since then I’ve written my first six novels. 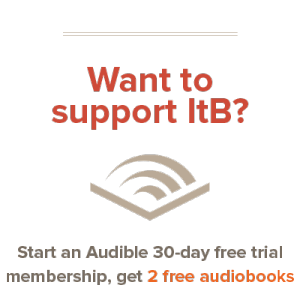 ItB: Where do you generally write? What time of the day is your favorite? Do you set daily goals? I almost always write in my bedroom, on my netbook computer. I write whenever I can, really I don’t actually have a preferred time. I set daily goals, but most often my goal is just to “write something” every day. With my first novel, I just wrote every day, sometimes ten pages, sometimes just a sentence or two. But I didn’t go a day without working on it, and that put me through to the end. For some novels I’ll set a more concrete goal, but generally as long as I do something every day, I’ll be fine. ItB: Do you have any tips for Sci-Fi authors who are just starting out (or any authors, really)? Persevere. Don’t give up, and don’t stop writing just because you lose interest in a story. Keep going, when it’s hard, when it’s horrible, when every sentence is junk. And don’t stress over your first draft — when you’re doing a first draft, press on. You can edit anything but a blank page. Then when your first draft is done, don’t let collect dust and be forgotten, don’t be afraid to mutilate it — dive right in with revision to make it better. It can be scary. It’s a hard road, full of obstacles, weariness, long hours of typing away until your fingers are sore and your brain mush and you never want to look at another word as long as you live, but the joy of sharing a story–a little piece of life that God has given you–with others, is worth every step of the journey. Thank you so much for the interview, Grace! Again, if you’d like to check out Grace’s book Firmament: Radialloy, or the other stops on her blog tour, you can do that at her website, here.